In an effort to ‘live off the land’ Drew and I have informally committed to using/reusing the materials we have at hand without purchasing brand new everything. This only works because both he and I are willing to have a less than perfect outcome. Sometimes I see people cringe because they’re not cut-corner types, but that’s not really our goal either. We just want to be efficient…sufficient…resourceful. 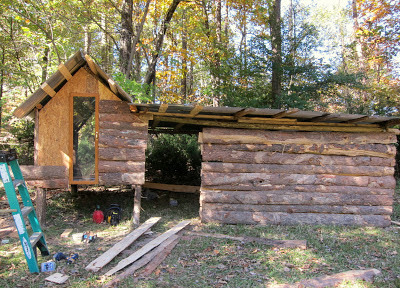 So, I think we’ve almost succeeded with our awesome Goat house/Chicken coop. 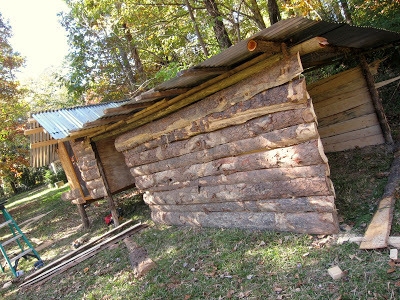 1. posts are all cedar timbers Drew cut down from around the property. Cheap, sturdy, weather/rot resistant without any pesky chemicals. 2. There’s an under-layment around the chicken coop part. 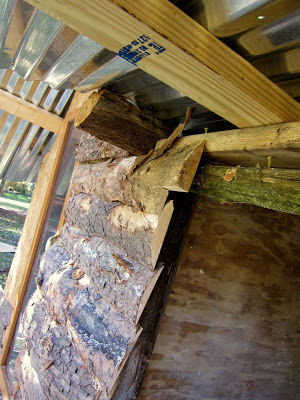 This is cut from a piece of plywood that was removed from the house during the ‘remodel’ (more of a ‘make-it-livable’). That means free. 3. There’s a plexi-glass door which will likely just gross us out once the chickens move in, but seems like a really cool idea. You might notice the knob–it was from a cabinet we demolished in the house. 4. Tin corrugated roofing was not free, but relatively inexpensive and pretty indelible. Other than it’s razor sharp corners, it’s a great solution for shedding water and reflecting hovering nosy satellite surveillance. Can never have too much of that. 5. The loggish siding? Well, that’s the major score and an idea that actually worked out great. Best of all. Free again. Well, we paid $65 to have it delivered from abut 45 minutes away, but we could have picked it up for free and we have a 4year old high size pile still left to use for whatever we want. You can be sure, we’ll put it all to use. What can we make? Docks? boats? bridges? We’ve considered siding the whole house. It’s mainly just pine, and some of the pieces are super thin and flimsy, but it serves this purpose amazingly well. There’s likely a place to pick this lumber-milling waste product near almost anyone. Check craigslist. 2 layers thick it’s a great solution for the goat side of the shelter. I hope they think so–goat experts might disagree. 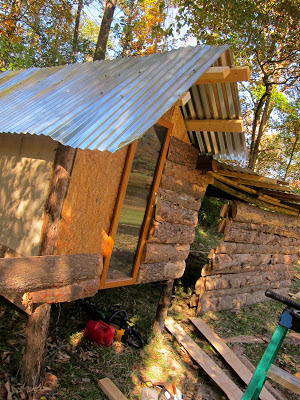 We made our chicken coop from completely re-purposed material-from the roof down. We only had to buy screws. It was very gratifying, although it did mean that the chickens had to live in temporary housing for a while because it just takes longer to figure out how to make it all fit.We could buy a lot of seeds with the $$ we would have spent on lumber and hardware had we made the hen house from new material. I love the fact that you ended up with a combo! Oh Cheryl, do you have a link to some pictures? I have some on my Facebook page (Cheryl Bice) from back in April-May. I could send you some if you want, we're pretty proud of it.